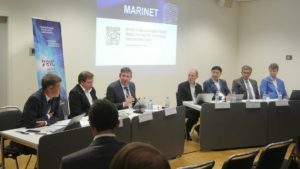 In the framework of the international exhibition SMM in Hamburg, MARINET hosted the international conference dedicated to the most promising technologies for the maritime industry, which was attended by companies and research centers from different countries of the world. The conference program included panel discussions on digital navigation and unmanned vessels, as well as a pitch session on the marine robotics. During the conference, Alexey Donskoy, Director of Engineering Center of Shipbuilding (ECS) told about the successful creation of unmanned boats by SPE AME and the conversion of the developed technologies for the civil shipbuilding. ECS in cooperation with AME plans to start in 2018 and 2019 a number of pilot projects to test autonomous and remote control vessels: sea/river bulk cargo ship, a small-tonnage tanker, a ferry and an icebreaker. “As of today, there is an international definition of an unmanned ship and its categories, current regulations are based on presence of people onboard” said Vitaly Klyuev.